In the vast emptiness of deep space, worlds colliding can be a messy event. But in the vast world of snacks, worlds colliding can be, well... awesome. Exhibit A: Irish Car Bomb Kronut Holes, basically the Munchkins version of those cronuts you’ve been hearing all about lately, only genetically modified with Guinness, Baileys and whiskey, available off-menu starting Saturday at Bokx 109. It starts like anything else in the baking world: with the steady hand of an inspired maestro deep-frying little croissant-donut dough balls until they’re golden brown (fine, it’s how everything should start in the baking world). Then they’re injected with a Baileys whipped filling. 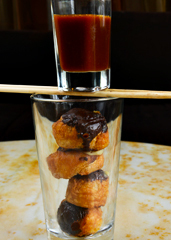 Then they’re doused with a chocolate Guinness reduction, placed in a pint glass and served with chopsticks. And finally, you put them in your mouth and probably say something like “These are f**king delicious.” Because they are. They are f**king delicious. Ah. And the whiskey. That’s there, too. It’s in the form of a caramel-cream dipping sauce. Should pair nicely with the regular form in your glass.